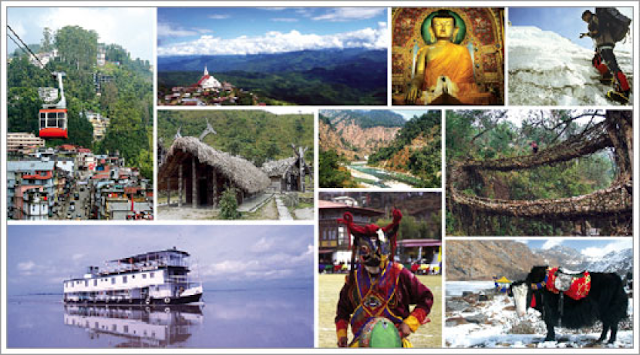 (e) whether the Government has any plan to organize fairs, festivals and exhibitions in the North-Eastern States during the next financial year to promote tourism and if so, the details thereof, along with the funds allocated for the purpose, State- wise including Assam? (a) to (c) Development of Tourism is primarily the responsibility of the respective State Governments. However, Ministry of Tourism provides Central Financial Assistance (CFA) for the proposals submitted by the State Governments including North Eastern States under its various scheme Guidelines subject to submission of Detailed Project Report (DPR), their adherence to Scheme Guidelines and availability of funds. Based on the proposals and DPRs submitted by State Governments of North Eastern Region, funds have been sanctioned for development of tourism in the North Eastern States under the Swadesh Darshan and PRASHAD schemes. The details for the last three years and the current year are given at Annexure-I. (d) The details of financial assistance provided to Assam in the current year for conducting training programme in Tourism and Hospitality are given at Annexure-II. (e) Ministry of Tourism provides Central Financial Assistance under the relevant Scheme guidelines for the proposals submitted by the State Governments/Union Territories for organizing fairs/festivals/events. MOT does not allocate funds for fairs and festivals for the future financial years. STATEMENT IN REPLY TO PARTS (a) TO (c) OF LOK SABHA UNSTARRED QUESTION NO.4322 ANSWERED ON 07.01.2019 REGARDING DEVELOPMENT OF TOURISM IN NORTH EAST. No. State Year of Sanction Scheme/ Circuit Name of Project Sanction Amt. Release Amt. LumSohpetbnengM awdiangdiang – Orchid Lake Resort, Meghalaya. STATEMENT IN REPLY TO PART (d) OF LOK SABHA UNSTARRED QUESTION NO.4322 ANSWERED ON 07.01.2019 REGARDING DEVELOPMENT OF TOURISM IN NORTH EAST. 2.09 IHM Guwahati has been released funds for conducting Tourism Awareness Programme in and around Kaziranga for improving the behaviour attitude of staff of Hotel, Restaurant, Dhabas, street vendors, volunteers, safari drivers, mahuts and shopkeepers to interact with tourists, both domestic and international. Food Craft Institute, Nagaon 9.26 The funds have been released for conducting skill development courses in the Hospitality trades under the Hunar Se Rozgar Tak programme under the scheme of ‘Capacity Building for Service Providers’ (CBSP) – an initiative of the Ministry of Tourism.